I'm a fickle fellow when it comes to haircare, I will flit from brand to brand; trying to find something to tame and style my thick and straight hair. 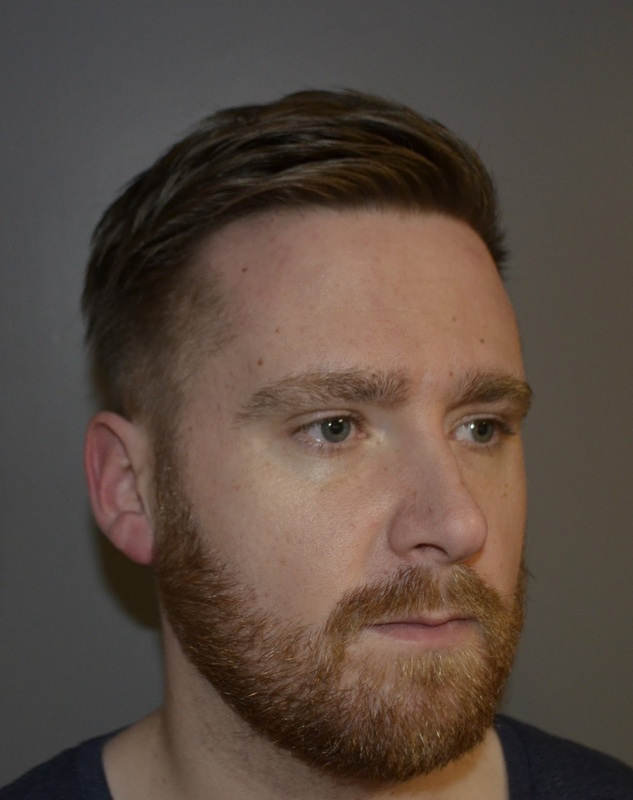 So I thought I would kill 2 birds with 1 stone in this post and put the product range from Osmo through its paces while having my most recent hair cut. As I've just said, my hair is thick and straight; (Caelan is in the same boat, but to an even greater extent). This could be a blessing in some cases, but to us, it means that it grows out quickly and loses definition and shapes in a relatively short period of time. And as much as I complain about this, I often leave too long of a gap between haircuts so by the time the scissors get near my mane, it's time for a complete overhaul rather than a touchup. We are very lucky that Caelan's aunt is a hairdresser and does our styling in the comfort of our house so I tapped her professional opinion on the Osmo range and asked her for some handy tips on how to get the best out of the products. 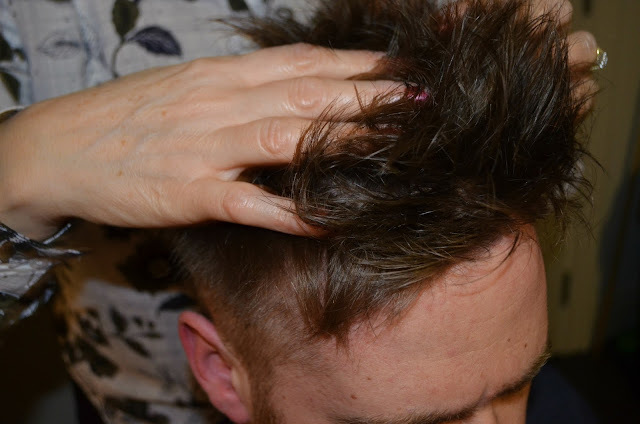 Osmo very kindly sent me a bumper selection of products to test and I have put off using them until I had hair that was decent enough to show on my blog! I went for a #2 clipper cut at the back and sides with length and definition kept on top. I find if it's too short all over, it tends to stick out more and it is harder to keep any style as my hair quickly becomes one unruly mass. I'm quite rough and ready when it comes to styling my hair, very rarely does a comb or brush feature in my routine. I love the versatility of my hair cut, I can go slicked and flicked with a quiff or messy and undone with a fallen fringe. Using thinning scissors to remove weight from the body of my hair and then applying the Osmo Shaper Maker to add definition and texture, I can have a slightly more fashion-forward style. The Fibre Paste is quite a liquid product so a little goes a long way. 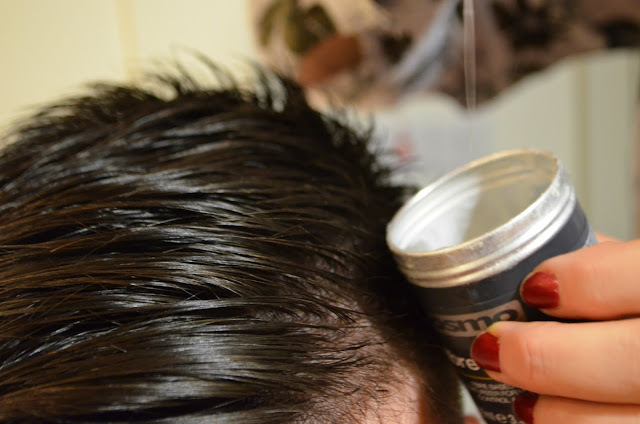 Many men are guilty of over loading their hair with product, resulting in hair that can look unnaturally wet or greasy. A small amount on the tips of your fingers is sufficient. Work this through your hair and take your time in blow drying to achieve the desired shape. Once you have the basic shape in, you can use additional products to define and hold your look. The Osmo Pomade Hold gives a shiny hold (without it looking greasy) or the Shaper Maker gives a looser hold with a softer finish for a more natural effect. As my hair is so thick, sometimes clay or wax can add unwanted weight but I've found a great use for the Osmo Clay Wax. Designed for ultimate hold, this heavy duty styling wax will give firm hold to hairstyles with natural beeswax helping to add strength and shine. I find that if I have washed my hair before I go to bed, I wake up with a completely fluffy and unmanageable mess in the morning. However, applying a small amount of the Clay Wax to my hair after showering and heading to bed, I find that it has tamed it over night, making the morning styling much easier. 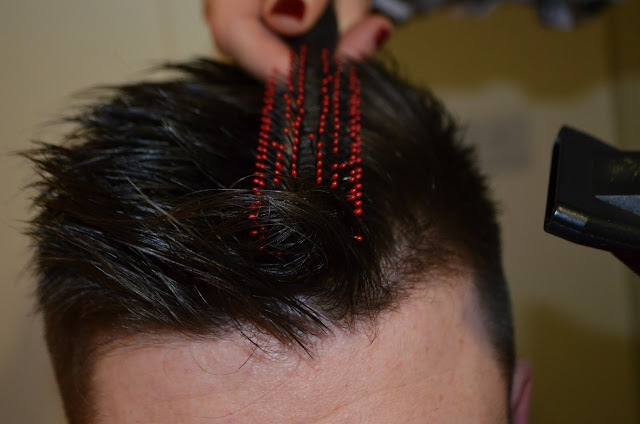 Try this any time your hair is too clean to hold a style. 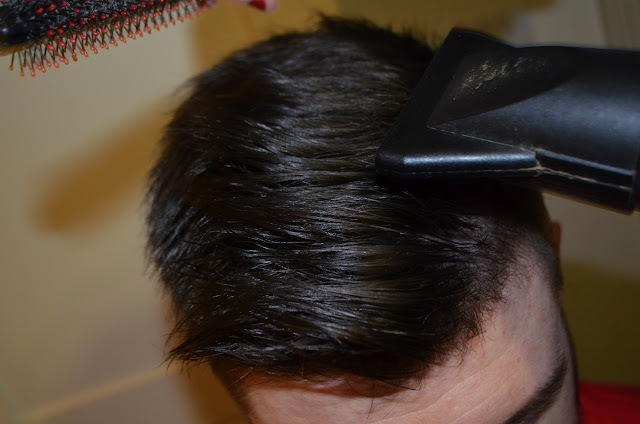 A small amount of the Clay Wax applied to your hair and either sleep on it or work on it with a hairdryer as above. BTW, having a hairdryer is pretty much a necessity if you are looking to curate a decent hairstyle in your own home. If you think you are too butch or manly, get over it and go buy one. Keep it in your tool box and treat it like a gadget. Osmo is available online and in selected salons across the UK. Thank you to Osmo for supplying me with a plethora of products to sample. Kicking off 2016 with a bit of a bang as I've been nominated for Best Fashion Blog at the UK Blog Awards 2016! I'm over the moon to be nominated. I've been blogging for just over 2.5 years and I am very proud of what I've accomplished in that time. 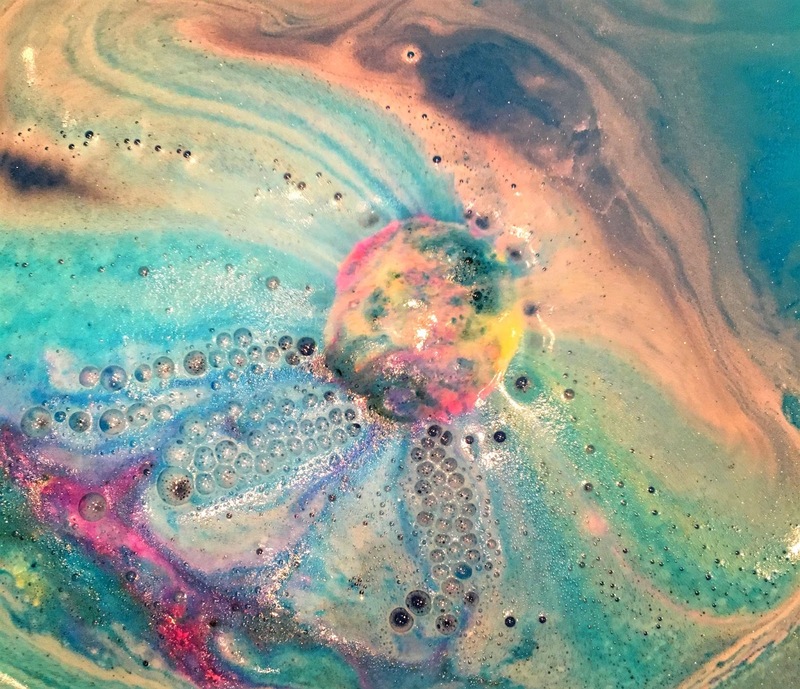 Yes there are most professional blogs out there; newer, shinier blogs but my own little corner of the Blogosphere is something I have created myself. It's great to see some male bloggers in the Best Fashion Blog category too. It is a very under-represented field but hopefully that will change. L:CM, Pitti Uomo and other men's fashion weeks prove that the male fashion industry is thriving and it is bloggers who are delivering the news faster and in more relateable ways compared to traditional press. I'd love it if you'd consider voting for me. Simply click the image below and follow the instructions. Public voting ends 25th January and you can re-vote daily so feel free to come back every day! Now I'm not heading under the knife (if it's not broke, don't fix it) but there comes a time when you need to take stock and maybe have a re-fresh of the old grooming routine. As such, I have to take preventative measures. Wrinkles and lines are inevitable but you can delay or mask their appearance. I was sent some products by Skin Chemists London from their men's range late last year and have been using them for roughly 8 weeks; I wanted to give them a proper test. There is not much point in trialling something of this scale for a weekend. 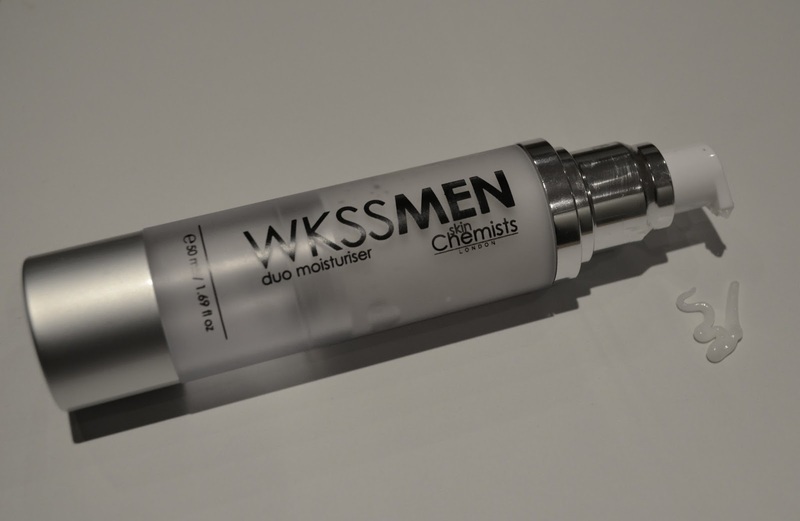 The Skin Chemists Wrinkle Killer Duo Moisturiser features their Syn-Ake technology, designed to mimic the effects of snake venom. While this sounds pretty scary, it is the mild muscle contraction that the moisturiser delivers that helps to smooth out wrinkles. On application, there is an immediate, mild, tingling sensation. This is the serum taking effect, helping to relax your skin to prevent the appearance of lines wrinkles. My heaviest wrinkles are around my eyes and between my brows (I guess I scowl a lot?) but this helps negate these while also keeping my skin feel hydrated. The mattifying effect also helps to reduce shine, which is a bonus if you have a problem with greasy patches like I do. 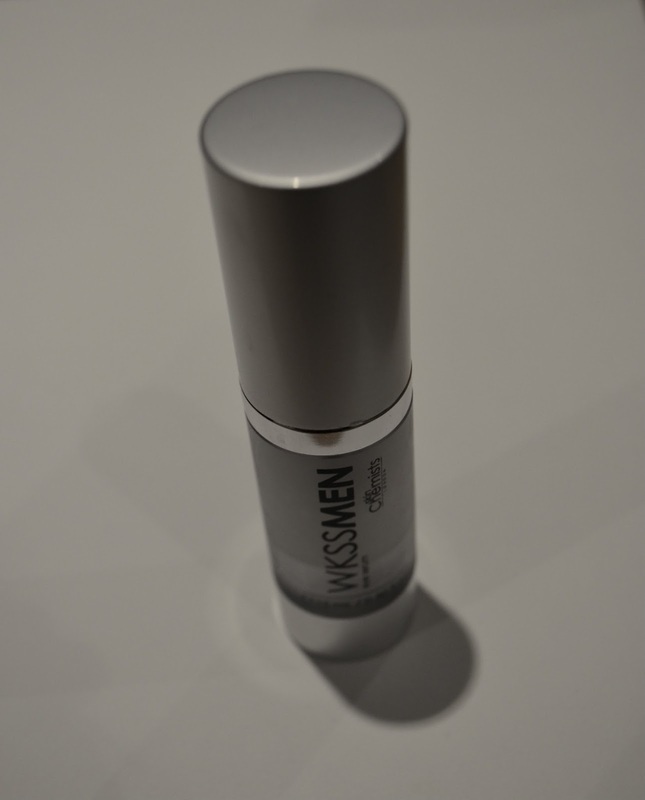 The Wrinkle Killer Eye Serum is designed to combat those dark circles and eye bags we all experience from time to time. Late nights and early mornings are not friends to faces so a little lift is never a bad thing. With the same Syn-Ake technology found in the Duo Moisturiser, the Eye Serum works on the softer tissue around your eyes. Since using the serums, my face has felt much fuller. I don't know if that is the correct term, but there is a tautness without tightness, a sensation of a fresh and healthy finish. Coupled with an improved exfoliating and cleansing routine, my skin is feeling better than it has in years. While the products are at the higher end of many men's grooming budget, they are a true investment. Like I said, I've been using them daily for almost 2 months and as the photos taken this evening can attest, there is plenty of product left. 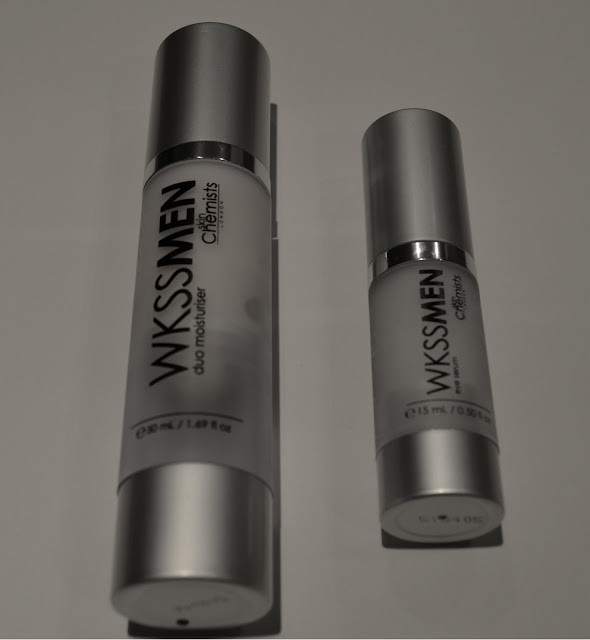 The Wrinkle Killer Duo Moisturiser costs £159.00, and I've been using is for about 60 days. This represents a cost of around £2.66 per day - that's less than the price of your daily coffee! Like I said in my previous post, I want 2016 to be the Year of the Rogue so taking better care of my skin is a good place to start. Thank you to the generous team at Skin Chemists London for sending me the products to review. Things have been rather quiet of late on my blog. Work, Christmas, my birthday and New Years put everything on the back burner for a couple of weeks but it's now 2016; the Year of the Rogue! I am lucky (or unlucky) enough to have my birthday on 27th December, meaning I get to stress out my friends and family even more looking for presents for me! This year I was well and truly spoilt by my generous circle of family and friends and was overwhelmed by each and every gift. I don't like to give hints, ideas or requests for presents as I love to be surprised. Apparently this makes me a nightmare to buy for, but my blog kind of works like a wishlist so I think it would be presumptuous to hand over a list! I thought I'd give you a sneak peek into some of the fantastic presents I got during the Christmas break, combining both Christmas and (gasp) my 34th birthday. I am fussy about my clothes, I wouldn't write a blog about it if I wasn't. This means buying clothes for me can be difficult. However I was given some fantastic pieces, combining dapper with casual, fun with function. All the other kids in their pumped up kicks have nothing on my new New Balance. Love this rich burgundy red, they will work with pretty much any shade of denim. I got 2 pairs of Bertie boots from Caelan, the tan Cedric boots above for Christmas and the navy brogues were for my birthday. I have a pair of much-loved Red Wing-style boots that are on their way out so I was on the look out for replacements. I love the bright white soles with the pops of colour. My new grey satchel from the Vintage Satchel Co. They are a Belfast-based operation, making hand-made satchels, you can find them in Studio Souk I have a beloved Cambridge Satchel in bright red, but sometimes a more sombre colour is appropriate. My friend Lizzie always finds some of the best presents, usually that little more unusual and interesting. She got me the cufflinks seen above and this beautiful vintage floral print fabric lapel pin. My blog-wife Ruth from Willow Lane got me this gorgeous merino wool scarf from J by Jasper Conran. The rich red is seasonal perfection - just the thing should I ever venture over my door. Will it ever stop raining?! I also got some gift vouchers and popped into town over the holidays and picked up a few pieces in the sale. Normally, I am a harcore sale shopper, but this year I thought I would be a bit more selective and considered in my buying. I picked up a few separates (they all turned out to be in shades of grey, I might have a colour addiction) to add to my wardrobe. I'm not getting any younger (as my recent birthday can attest) so I'm trying to take better care of my skin and my looks. This involves more effort than I previously have bothered with but hopefully it will all be for the greater good. I am a man of simple scents. I have a few go-to fragrances which have been getting pretty low of late so I was really happy to get a restock. I was feeling a little nostalgic so I had challenged my sister to find me white Diesel Plus. This was my failsafe scent in my early twenties but I thought it had gone out of production. A quick spritz on Christmas morning and I was transported back to the early 00's when I was an even worse dresser than I am now! John Varvatos Artisan has been my favourite fragrance for almost a decade. I discovered it by accident in Gatwick airport but couldn't find it anywhere else when I got home. Luckily, it is now available in Debenhams and Caelan got me the original scent and the Artisan Aqua as a new season alternative. I really can't recommend this scent enough. If you are looking for a light, easy-to-wear, fresh fragrance, check it out. We have a bit of a Christmas Eve tradition in our house where we exchange some gifts early. My gifts to Caelan usually consist of new slippers and some accessories; this year he got a new hat and scarf, and his gift to me is some fun bits and pieces from Lush. I used my Intergalatic bath bomb on New Years Eve to unwind after an impromptu 13hr stocktaking shift in work. Kalamazoo beard wash was one of my best discoveries of 2015. This citrus-y facial wash helps get rid of grease and also gives my beard a good seeing-to, clearing out all that dead skin underneath! Still with me? Good! This category is possibly a little vague, but it's those gifts that just make life better. My favourite book growing up was (and still is) Watership Down. I remember watching the film as a kid and while everyone else was traumatised with the blood and gore, I loved the whole mythology, sociology and message contained within. I read it first in primary school and have continued to re-read it periodically over the years. It's a bit of a comfort blanket. So imagine my surprise and delight when I found a special edition signed copy under the Christmas tree! Such a thoughtful and heartfelt gift, it's something to treasure forever. My final selection of gifts are ones that will help me improve my blog. I am trying to improve my photography and have recently made the switch from relying on my phone to using the Nikon DSLR we have. I am a little cautious as I know very little about photography but it will be fun exploring and experimenting. Caelan had previously given me a tripod and remote (which I surreptitiously used in my recent Christmas Jumper Campaign post), and I hope to use these more in outfit posts in the coming year. He also gifted me with a ring flash for my birthday (which I ironically did not use taking this photo) to help with my photography. I am a little/very scatter-brained and tend to have a ton of ideas rattling around my head. Sadly, very few of them manifest as they are forgotten or overwritten. So I hope to become more organised in 2016... Enter my personalised blog planner. Like a diary specifically created for bloggers, it couples a daily planner with checklists, ideas and note sections. Finally, the pièce de résistance, is my fantastic new iPad Mini 4. I've held off on owning a tablet for many years. My phone is an extra limb but I thought I wouldn't have use for a tablet. However, the iPad Mini makes it so much easier to blog on the go. This was my main birthday present from Caelan and at first I was reluctant to accept as I know how much they cost. However, I couldn't be more grateful for it and his generosity. I hope everyone had an enjoyable time over Christmas, it can be a time of fun and frolic but also a time of stress and distress. However you spent yours, I hope you were happy. All photos property of rogues+brogues. *My new years resolution is to get a new photography back drop. You're probably as sick of seeing my breakfast bar as I am!